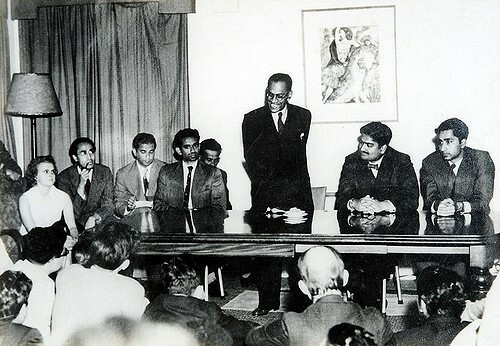 The political and social upheaval of 1956 has been always received mixed reactions in Sri Lankan society. For some it was the monumental event in post-colonial Ceylon that common man disrupted the social and cultural hegemony which was predominantly consisted of Colombo based English speaking elites .For some it was just the beginning of all the despicable political acts in in country’s post independent history where gullible common man became the victim of political chicanery and implementations of 1956 such as the promulgating Sinhalese as official language curtailed the ethnic homogeneity in the island resulting tension between Sinhalese majority and Tamil minority which eventually paved the path to the bloodiest civil war lasted for 30 years . Nevertheless, assessing the character of the man behind the events of 1956 has always been another tiresome task as his personality remains an enigmatic riddle. Those were the words uttered by the architect of 1956 revolution in post independent Ceylon, Solomon West Ridgeway Dias Bandaranaike after returning to the island in 1925 as a graduate from Christ Church in Oxford. Understanding his mind would be the horrendous task that one can face in examining the political project led by this man in post independent Ceylon. This was problem regarding ascertaining the genuineness of most of the post-colonial leaders in South Asia from Nehru of India to Bhutto of Pakistan. Having grown under British colonial influence with privilege Oxbridge education all of them had discontents with those English ethos, struggled to embrace the nationalist sentiments while trying to understand the native culture, yet, all of them were deeply attached to the British cultural values in their private domains. This peculiarity compelled Nehru to describe himself as the last Englishman to rule India. However, the case with Bandaranaike was rather a different one and it was more or less about a journey of man who sought a platform to be superior. Perhaps his personality can be an interesting model for Lacanian psychoanalysis with the dozens of strange actions left behind his character. Famous biography of SWRD Bandaranaike written by James Manner in 1988 has revealed how Bandaranayake was groomed since his childhood days to become maha mudliyar which happened to be the highest office held by a native under British rule in Ceylon and Bandaranaike-Obeyasekere families had dominance over holding this position for generations as most loyal servants to British colonial rulers. SWRD’s father maha mudaliyar Sir Solomon Dias Bandaranaike’s auto biography Remembered Yesterdays” probably a ghost written work has been forgotten today, but its detailed picture on the lavish life style of maha mudliyar is more than enough to assess the childhood of SWRD in early 20th century Ceylon. In examining the seeds of ambitions sparked in Bandaranaike’s mind to maintain his authority and to be dominant that one should look at how he spent his childhood under the tutelage of British tutors in Horagolla. Bandaranaike’s early childhood education was confined to his ancestral home in Horagolla where two British resident tutors named A.E Radford and Henry Young provided him the elementary lessons. However, memories written by SWRD in later years convinces the reader that his childhood education under British tutors at home was filled with anxiety and disappointments as both tutors tried to nourish SWRD under their own ideals. The brief time he spent at S. Thomas’ Mutwal was another crucial juncture in molding his early years under Warden Stone’s guidance. His contemporaries had admitted that young Bandaranaike was given a special privilege being the son of maha mudaliyar and he was boarded at Warden’s bungalow. However, the honored life style he received in Ceylon was vanished after he began his undergraduate years at Oxford, where he was a mere wag and none of his upper class Ceylon heritage guarantied him any place. Moreover, his flair for classics was scornfully discouraged by his tutor at Christ Church; Oxford who advised Bandaranaike to be cautious with his choice of classics as it was manly confined to the boys came from British public schools such as Eton and Harrow. Memories of Oxford were serialized in Ceylon Causerie magazine after SWRD returned to Ceylon and it depicts the discontents he encountered with at Oxford. The man who appeared to be the silver tongued orator of Asia and Diyasena” for common man in 1956 had not forgotten his rich elite upbringings in his Oxford Memories. Though his narrative was begun with a sense of cultural dislocation, he did not forget to include some references to his privileged background. For instance, at the beginning of his account SWRD Bandaranaike tells It was not just an accident that my name was entered by my father in the books of Christ Church, about ten years before I actually went up”. Another interesting event showing Bandaranaike’s enigma in his personality was the anomaly he continued to uphold regarding his position on India. After acquiring his mastery as an orator at Oxford Union his fervent criticism of British rule in India often brought his fame as a debater at Oxford. The magisterial oratorical triumph he witnessed at Oxford happened to be a speech he delivered at a debate on British rule in India where he defended the proposition that indefinite continuance of British rule in India is a violation of British political ideals. Later Bandaranaike expressed how strongly his speech captured the audience as the applause he received lasted for few minutes. He compared the British love of freedom to the pictures of the Italian Renaissance and culminated his speech by saying where you find a thread of golden light pervading the whole work; it is in the air, it dances in the eyes of men and women, it flickers in their hair, and is woven in the very texture of their flesh. And the thread of golden light which illumines forever the life of this people is their love of freedom and free institutions…’ Having expressed such an ardor on liberating India from British rule, yet Bandaranaike had a distant relation with Indians and its culture at Oxford. His memories provide evidence that Bandaranaike seemed to have abhorred Indian social life at Oxford, perhaps in order to prevent him being marginalized on the basis of race or colour. However this duplicity was rather paradoxical and he was not the first Lankan to pretend to be more pro Indian while simultaneously keeping a disinterest in Indian society, because Dharmapala did the same in Japan by introducing himself as a representative of Indian Buddhism. The anglophile nature of Bandaranaike was not entirely an outcome of his Oxford experience as Nehru and Butto. More than his exposition to English culture, his ambition sparked since his childhood to be the superior over others may have been a crucial factor throughout his double standing political career. Before I am their equal I must first be their superior” this was the very words he uttered and committed to the core before acquiring his glory at Oxford, however his Oxford glamor was slightly marred when his hope to become the president of Oxford Union was ruined at the union election. In examining SWRD Bandaranaike’s childhood and his days at Oxford, that one can easily identify the roots of social cultural anomalies he maintained in later political career. His attraction for native Sinhalese culture was akin to Jawaharlal Nehru’s effort to embrace Indian culture, yet Nehru had his higher nourishment from Gandhi, whereas there is no direct link to demonstrate whether Bandaranaike was influenced by Dharmapala directly in carving his entry to Sinhalese Buddhist nationalism. In the writings of Gunadasa Amarasekere, Amarasekara had often regarded Dharmapala as the founder of Sinhala nationalist revival and Bandaranayke as his successor. But it is doubtful to examine whether those nationalist sentiments propounded by Dharmapala actually played a key role in Bandaranaike’s psyche. All in all SWRD Bandaranaike’s character remains a mystery that gives no clue to identify his vision. Perhaps the expression used by his class classmate at S.Thomas’ Canon R.F de Saram when SWRD Bandaranaike was invited to S.Thomas’ College prize giving as chief guest in 1958 may be the apt words to introduce him to the future. This is said to be the age of the common man. It May be so. But it is certainly also the age of the Demagogue. the man with the loud voice and fluent vocabulary and specious tongue who debases his gifts by devoting them to misrepresentation of facts, the stirring up of hatred, the vilifying of persons and causes to which he is opposed the man with much cleverness but little wisdom who is prepared to sacrifice the peace and prosperity of the country to the gaining of some petty personal or party triumph”. Banda was the son of the big Mudaliyar but was a beggar. Did he had a sister an what about her, that might give us some insight to his life. What is important to us Sinhalese is his what he did to us Sinhalese. Indian Colonial Parasites of the country always wanted to control us politically and they tried this with financing the Socialist movement in the country. The Indian Parasite Cabal financed the Socialists movement and provided them with the ideology, policy and plans. Indian Parasites had the full control of the local economy then as they do now. They financed the Socialists and the best examples are N M Perera financed by Captan and Phillip by Gnanam. Indian Cabal could not get control so the got hold of Banda with Parasites like Hidramani and formed the SLFP. The Tamils Separatist terrorism had nothing to do with local politics. It is Indian plan to get hold of Trinco for its Navy. Remember India was in the lap of the USSR. India not only created Tamil terrorist it also hijacked the North Korea made Jeppos to kill Sinhalese and wipe Sinhalese out from the Earth.